The portrait dolls below were sculpted by doll Artist Debbie Olsen. They are made of porcelain and are in 1/12 scale (1 inch = 1 foot). Please click on the thumbnails below to see the larger version of the photos. "BLUE CANNON": This is a one-of-a-kind portrait doll of Mark Slade playing the character "Blue Cannon" on the old tv western "High Chaparral". This doll was commissioned by a big fan of the show. He is not for sale. "MANOLITO MONTOYA": This is a one-of-a-kind portrait doll of Henry Darrow as he looked playing the character "Manolito Montoya" on the "High Chaparral". He now lives in a 1/12 scale adobe ranch with the "Blue Cannon" doll above. He is not for sale. ERIKA SLEZAK: This six time daytime emmy award winner (who plays Viki Lord Riley Buchanan Carpenter on "One Life To Live") is my favorite actress. Erika has such a wonderfully expressive face, I just had to capture it for all time. She looks great in period costumes. Her doll name is "Erika". She can be found in the Customized Dolls section as well as in the Doll Kits section. ANNA LEE: The late Anna Lee played the lovely matriarch Lila Quartermaine on "General Hospital". Her doll name is "Anna". Soon I will be sculpting John Ingle, who plays her dashing and debonair husband "Edward Quartermaine". Anna is available as both a Customized Doll and as a Doll Kit. BASIL RATHBONE: Basil was my first celebrity portrait doll. I have always loved his portrayal of Sherlock Holmes. He has been a very popular doll, especially for Sherlockian room boxes. His doll name is "Basil". 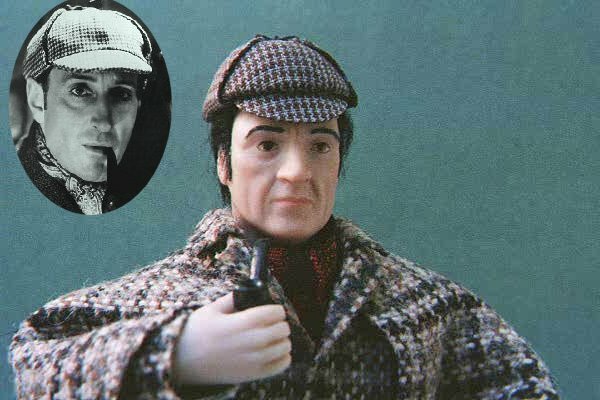 Visit my Character Dolls section to see Sherlock Holmes dressed in his Inverness coat and deer-stalker cap. NIGEL BRUCE: Where would Sherlock Holmes be without his faithful companion Dr. Watson? Nigel Bruce played alongside Basil Rathbone in 14 films, so it it only seemed right to team them up again. His doll name is "Nigel" and you can purchase him dressed in a chesterfield coat from my Character Dolls section. PAT: This gentleman is not famous. He was kind enough to pose for pictures so that I could sculpt him just because I liked his face. His doll name is "Patrick". He can be found with the rest of my Men Dolls. WHITEY HERZOG: I watched a lot of Cardinals' baseball in the '80's and Whitey made me really appreciate the role of the manager. I think he has an interesting face. He is available in the Customized Dolls section. His doll name is "Whitey". He comes with or without a crew cut. OZZIE SMITH: I think Ozzie was the greatest shortstop of all time. I was inspired to sculpt him during the 1985 World Series. He is a one-of-a-kind doll and can be purchased from the Available Dolls section. The Portrait Dolls in this section are mainly portraits of celebrities who I admire. I use them as examples of my work because they are so widely known you can more easily see whether I've captured their likeness (or not). Most of them are also for sale in my " Dollhouse Dolls" section. My true Portrait Dolls are one-of-a-kind dolls of people like you and your family. I consider Portrait Dolls to be very special because they capture someones likeness forever. I like to imagine that 2,000 years from now some archeologist will dig up one of my Miniature Dolls and put it on display in a museum. They are meant to become wonderful heirlooms to pass from generation to generation. Many collectors enjoy seeing themselves, their families, (even their ancestors) in period costumes. Portrait Dolls make a room box or dollhouse really come to life. They also look great in a glass dome. I hope you enjoy seeing my dolls. Consider one for yourself or for someone special. Most of my one-of-a-kind Portrait Dolls cost $495.00. Dolls that require special accessories or elaborate costumes may cost more. If you have any questions you would like me to answer, please fill in the form below and click on "submit". I will answer your question by e-mail (so be sure to include your address on the form).You will automatically be signed up to receive updates when I add more miniatures to my site (unless you indicate otherwise).